Repeatedly entering the password can become a life task especially at home desktop PCs, Windows 10 tablets and the unique Microsoft Surface Pro that you keep well protected and have access to it all alone! Here's an easy way for Microsoft OS how to skip password entry and save time! 1.) 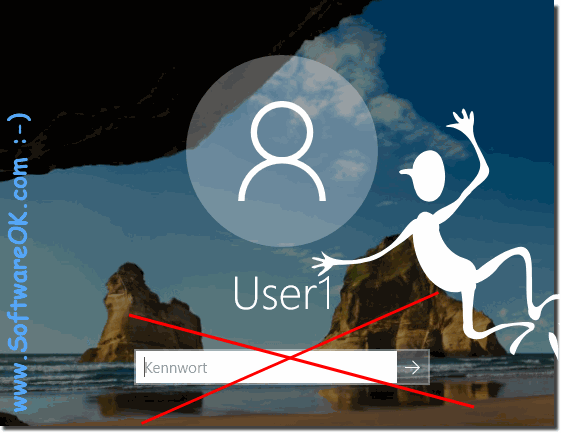 ... Auto login in Windows 10 without password! 2.) ... Many users of home computers and laptops disable password entry! See also: ► system administrator in Windows 10 with full access! 1.) Auto login in Windows 10 without password! Uncheck the check-box "Users must enter an user name and password to use this computer." and click the button Apply! 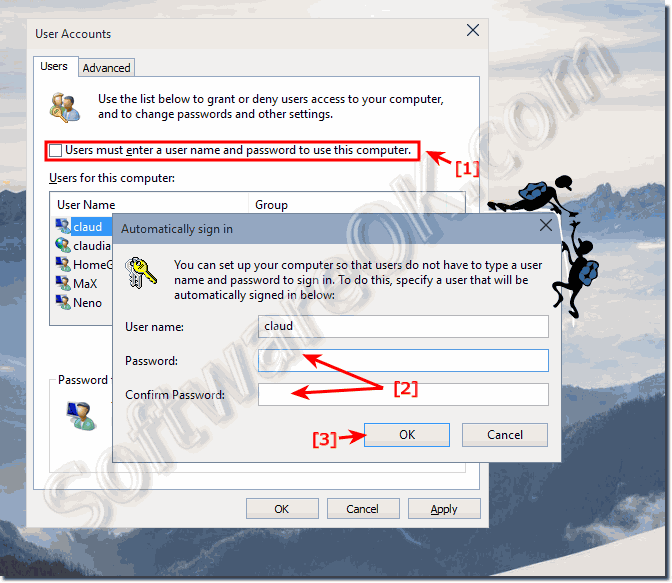 (Image-1) Autologin in windows 10 without password! When you start Windows 10 or the old Windows 8, you will be prompted to enter a password to log in. This allows you to protect your computers from unauthorized access. However, if you are the only person who uses a computer and does not want a password to query Betsy every time, you can cancel the process and log in to Windows without entering a password. Many users of home computers and laptops disable password entry! If you log in for convenience. So also in Windows 10 or 8.1. In this respect, Windows is no exception. For security reasons, this is of course a risky decision. While on the other side on a home computer where nothing important is stored, only photos, music, movies and games make it almost pointless to have a password retype that for the account every time. This FAQ is to disable password entry in Windows 10, so you don't have to re-enter when you log in again! 2.) Many users of home computers and laptops disable password entry! When they log in for convenience. So also in Windows 10 or 8.1. In this regard, Windows is no exception. For security reasons, this is of course a risky decision. While on the other hand, on a home computer that has nothing important stored on it, just photos, music, movies and games makes it almost no use having to re-type the account for the account each time. This FAQ allows you to disable password entry in Windows 10 so you do not have to re-enter it when logging in again! See also: ► Autoplay ► Windows 10 install without product key! 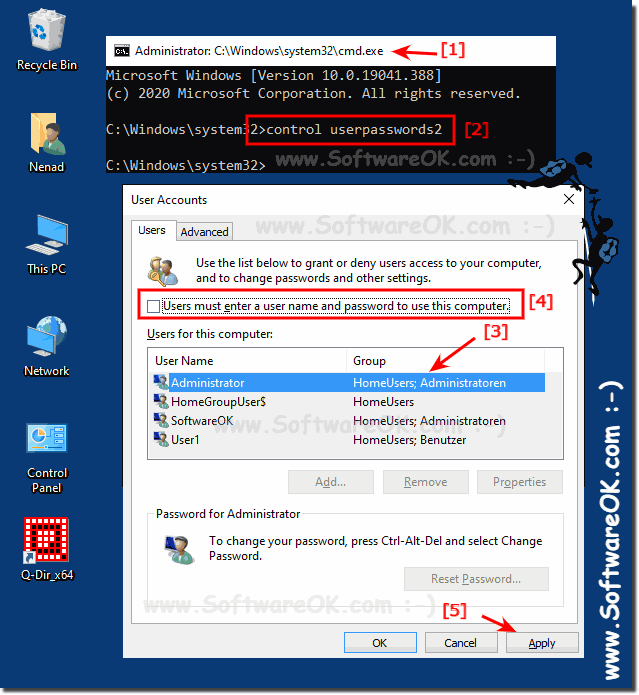 (Image-3) Auto login windows 10 without password! If you're the only user of the computer / tablet and would like to save time and speed up the sign-up process, you should enable automatic sign-in for your Microsoft account. It is very easy to do this. This method has been used for automatic logon for years, but many of our Windows User are still forget this solution how to do Auto-Login. Follow this simple instructions. As you can see above in Windows 10 shot screenshot, disable the password for auto-login without password, no magic is necessary, the Harry Potter can continue to Brexit or play cuidich with Joanne K. Rowling for money. You can apply this example as a login solution easily and without further ado as an unquestioning login without a password on earlier and older versions of Microsoft's Windows operating systems to log in and use, no matter if it is a Windows desktop, or you password entry on the tablet PC, Surface Pro / Go, spare or even want to work on a server operating system without a password. It really makes very sense to use this secret feature very meaningfully, it was tested at all and successfully verified.